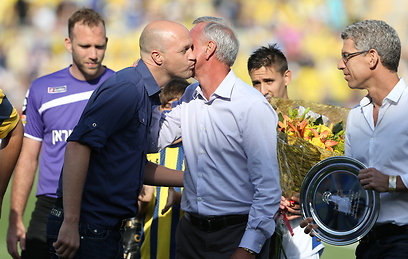 Johan Cruyff was excited to see his son, Jordi, Maccabi Tel Aviv's sports director, celebrate with fans after the team was crowned as the Israeli football league champion for the 2012-2013 season. But it seems one of the best footballers of all times had another personal reason to be highly moved by his recent visit to Israel. Under a veil of secrecy, the 66-year-old Cruyff filled out a Yad Vashem witness form in Tel Aviv. In a deposition he signed, the former Dutch footballer provided all the details he had about three Jewish women, members of his family who were murdered by the Nazis. Johan Cruyff's name has been written in golden letters in the pages of the global history of football for years. He led the Netherlands to a runners-up medal in the 1974 World Cup, but reached his peak in Barcelona – first, in the 1970s, as one of the best and most popular players in the history of the Catalan team, and later, starting in 1988, as the most successful coach in Barcelona's history. Contrary to rumors that have surfaced over the years, Johan Cruyff is not Jewish. His family, however, is strongly connected to Judaism. Many of his relatives married Jews, including his sister-in-law. Her son, Pascal Pop, converted to Judaism and immigrated to Israel after participating in the Maccabiah Games in the early 1990s. He studied in a yeshiva in Jerusalem, and after being ordained as a rabbi he moved to the settlement of Mevo Horon, but remained in touch with his uncle Johan and cousin Jordi over the years. Pop, 45, was the person who convinced Cruyff recently that it was time to commemorate three distant relatives, who were also Jewish and died in the Holocaust. "The sister of Johan's mother married a Jew, Jonas De Metz," Pop explained. "De Metz had three sisters who were murdered by the Nazis during World War II." Until now, Yad Vashem has had no record of these women in its central database of Shoah victims' names. Cruyff asked Pop to bring him Yad Vashem's witness forms when the two met in his hotel in Tel Aviv. The depositions include the personal details of the three Holocaust victims: Judith and Regina were 44 when they died, and Rozette was murdered at the age of 42. Yad Vashem, Israel's official memorial to the Jewish victims of the Holocaust, hopes that many other people will follow in Cruyff's footsteps and fill out witness forms for relatives murdered in the Holocaust. Maccabi Tel Aviv owner Mitchell Goldhar, the son of Holocaust survivor Sala Goldhar, was surprised to hear from Cruyff that he also had relatives who were murdered by the Nazis. "Johan, who arrived to share our joy in Israel, amazed us during the visit when he revealed his special connection to the Holocaust," Goldhar told Yedioth Ahronoth. "He was excited to fill out the Yad Vashem form, and we were moved too." See all talkbacks "Johan Cruyff honors Jewish relatives "